Architect Jo Coenen shows his competition design for a new architecture museum to Elco Brinkman, then Minister of Welfare, Health and Culture. Het Nieuwe Instituut Collection, NAIN archive. ‘What on earth happened to the NAi?’ Last May I met various foreign friends at the biennale in Venice. ‘That’s a long story,’ I replied. Anybody faced with the same question today can refer to the book The NAi Effect: Creating Architectural Culture, the thesis with which Portuguese architect Sergio Miguel Figueiredo earned his doctorate two years ago from the University of California Los Angeles (UCLA). 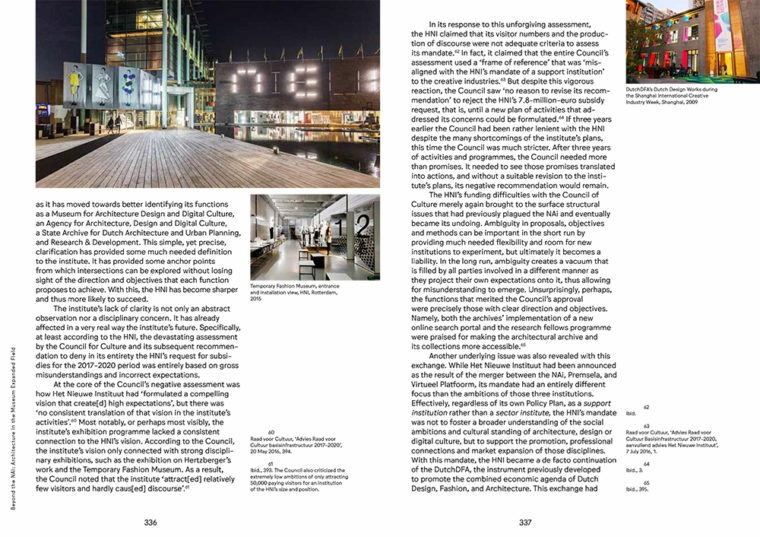 Figueiredo carefully chronicles the germination, flowering and decay of the Netherlands Architecture Institute (NAi), which was forced to make way for Het Nieuwe Instituut in 2013. Figueiredo is disappointed and biased. And so too am I. Interest declared. From 1980 on I was employed for eighteen years by the NAi and one of its precursors, the Stichting Wonen. So I witnessed the preparations and early years of the institute from close-by, and, as editor of the periodicals Wonen-TABK and Archis, I frequently commented on developments. But reading The NAi Effect made me realize that I have now completed all phases of the grieving process. That is probably because the process had started much earlier. The NAi has unfortunately ceased to exist, but luckily, so too has its humiliating ordeal. 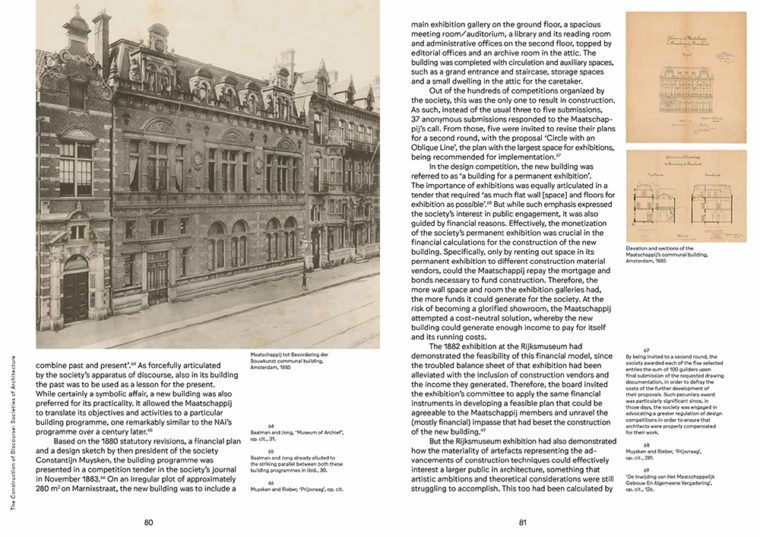 The first architecture institute: Gerard Schill and D.H. Haverkamp, Gebouw der Maatschappij tot Bevordering der Bouwkunst, Amsterdam, 1885, page 80 and 81, The NAi Effect, Sergio Figueiredo, nai010 Publishers. The NAi was founded in 1988 as an official industry institute with a broad agenda. It collected and managed the archives (preferably complete) of architects, ran a library and reading room, compiled exhibitions, organized lectures and debates, and issued publications, including a magazine. It was the result of a complicated process in which three parties – The Netherlands Architecture Documentation Centre (NDB), the Architecture Museum Foundation (SAM) and the Stichting Wonen foundation – who pressed for a merger with increasing energy. And it all happened with the approval and support of the two collaborating departments, the then Ministry of Welfare, Health and Culture (WVC) and the Ministry of Housing, Spatial Planning and the Environment (VROM). Thanks to Ruud Brouwers, the Stichting Wonen – which had its roots in a post-war information centre that promoted a ‘new housing culture’ – transformed into an interdisciplinary and half-activist support centre that responded to the dynamism of urban renewal. It then widened its mandate to ‘generating interest among a broad audience for the cultural dimension of architecture and urban design’. Brouwers also developed an exhibition programme for the narrow space on Leidsestraat to complement Wonen-TABK, the magazine he oversaw. SAM was founded in 1955 as the successor to the pre-war Exhibition Council, a partnership between the Royal Institute of Dutch Architects (BNA) and the Architectura et Amicitia society (A et A). SAM was largely active on behalf of the professional communities in lobbying for an architecture museum. Once that goal had been achieved, it could disband and transfer the archives it administered to the state. The NDB, founded in 1971 as a base for the deteriorating archives, had hardly any qualified personnel. The lack of suitable climate conditions in the attic of the Droogbak building in Amsterdam and the archival nonchalance threatened the condition of the documents entrusted to the state. NDB staff, however, wanted the knowledge gathered in the archive to facilitate research, exhibitions and publications, which was very much against the wishes of the Cultural Heritage Agency of the Netherlands, of which the NDB was a subsidiary. Nevertheless, it enabled scholars, doctoral students and interns to conduct research. Exhibition space was sometimes used at the Stichting Wonen or in existing large museums. The collaboration between the three merger partners became more intensive in the 1970s. 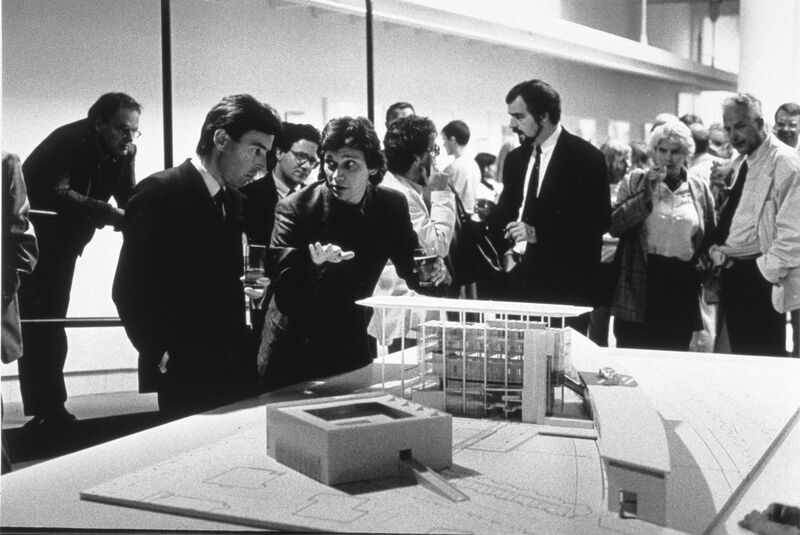 Pressure on the government to establish a broad architecture museum culminated in powerful, publically visible, results: a quartet of exhibitions (Berlage, Architectura, Amsterdam School and Americana) in 1975, and five parallel exhibitions on Dutch Functionalism in 1982. All of them accompanied by catalogues filled with weighty articles with footnotes. It seemed as if the art historians involved had suddenly received a visa to the twentieth century. Minister Elco Brinkman might easily have got the impression that this synergy only needed a new, institutional framework. Accordingly, in 1983 the founding of the NAi was announced on behalf of Brinkman by Director-General Jan Riezenkamp during the opening of the First Biennale for Young Dutch Architects. What followed was a period of careful construction of an institute, interrupted only by the ‘city competition’, which ended with a trade-off: a willingness to leave Amsterdam in exchange for the promise of a new building in Rotterdam. A whole plethora of steering committees and study groups were assembled, and fact-finding missions were undertaken to similar institutes abroad. The new Canadian Centre for Architecture (CCA) in Montreal was particularly significant in defining the level of ambition. By 1988 the NAi foundation had been established, and a year later Adri Duivesteijn was appointed director. A policy plan followed, and Queen Beatrix opened the building designed by Jo Coenen on 29 October 1993. 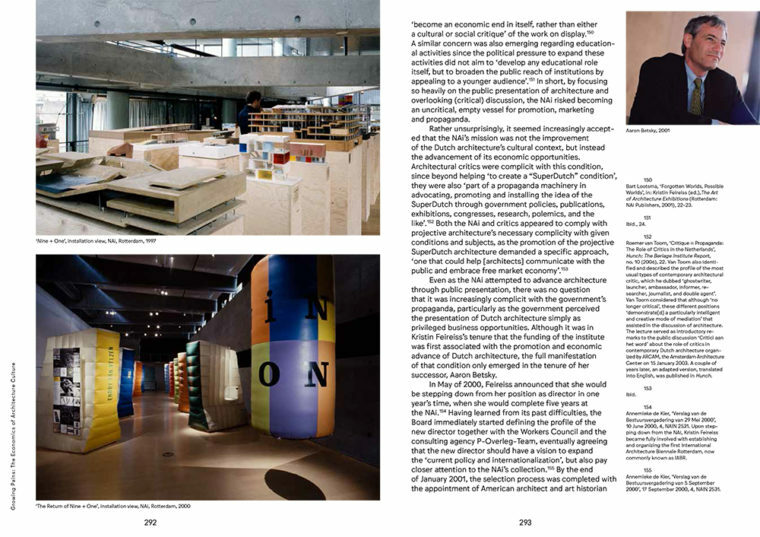 The exhibitions Nine + One (1997) and The Return of Nine + One (2000), pages 292 and 293, The NAi Effect, Sergio Figueiredo, nai010 Publishers. Just like the bible, The NAi Effect is a salvation history without a happy ending. I have summarized the New Testament above from the stable in Bethlehem to the entry into Jerusalem. The subtitle, ‘Creating Architectural Culture’, however, applies in particular to the first part of the book. Just like in the Old Testament, later events acquire their cultural-historical significance, are ‘foretold’ by prophets, or sometimes occur, mysteriously enough, for the first time. It is astonishing, for example, to read that an architecture institute existed as far back as the 19th century. Thanks to the boundless energy of Johannes Hermanus (Jan) Leliman, a ‘stately building’ opened on Marnixstraat in Amsterdam in 1885 for the Society for the Promotion of Architecture. It contained space for archives, exhibition galleries, meeting spaces, a library and reading room, and offices. It collected not only beautiful drawings but also structural and decorative building elements, working drawings, travel sketches and correspondence. In short: an exact mirror image of the later NAi. What on earth happened back then? Well then, the enlightened Society merged in 1918 with the BNA, which focused more on professional matters such as title protection, fee scales and the social recognition of the architect’s position. Three years later the building closed and was sold. Jan Leliman was long dead by then, but his son Willem – who in 1884, at the tender age of seven, had laid the foundation stone on Marnixstraat, and followed in the footsteps of his father in all respects – had seen the decline coming. In 1912, writing in De Bouwwereld, he advocated the establishment of ‘an architecture museum’. He was later referred to ad nauseam as the John the Baptist of the desired NAi. Figueiredo’s book makes clear that we should have credited his father, and not Willem, with that role. The first part of The NAi Effect takes the reader back to the 19th century. That was the era when the doctrine of Alberti – the architect does not build, but makes drawings – resulted in the creation of an independent professional group within urban civic society. A demand for architectural culture arose around the same time. People longed for a debate (civilized, among gentlemen) that tied together historical legacies and theoretical insights to form a disciplinary identity that had been lacking since the decline of the classical Vitruvian tradition. That would distinguish the architect from the engineer, the master craftsman and the builder. To create a market for that added cultural value, it was necessary to communicate architectural culture to a wider audience. Signing of a partnership agreement between the NAi and project developer VANKE for the construction of affordable homes in China, 2011. 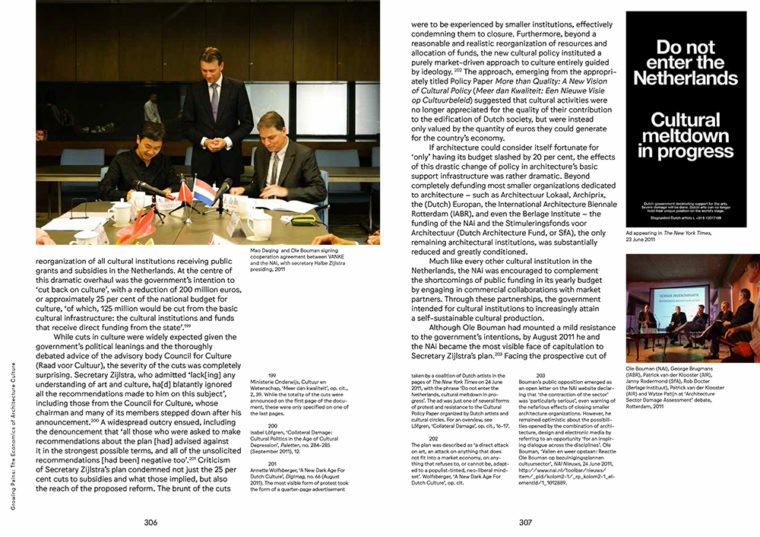 From left: Mao Daqing, Halbe Zijlstra, Ole Bouman, pages 306 and 307, The NAi Effect, Sergio Figueiredo, nai010 Publishers. Figueiredo explores the dilemmas that started to shape development. In the early chapters he summarizes them in contrasting categories. But frameworks of abstract concepts are more useful in classifying collections and institutes than in explaining the history of their origins. For instance, he distinguishes between collections with critical depth and those of encyclopaedic breadth. In the case of the former, the archive corresponds with the message. Inigo Jones collected Palladio drawings not only because he considered them beautiful but also to provide support for Palladianism. More appropriate to the educational intentions of the Enlightenment are museums of encyclopaedic breadth, where various interpretations can challenge one another. Figueiredo solves it with an old-fashioned dialectic synthesis: the collections of both the CCA and the NAi are superior because they embody characteristics of both. Another example. Figueiredo goes to great lengths to draw a distinction between a reflective and a projective museum or institute. To Figueiredo, reflective stands for preserving and archiving great works of the past, which were exhibited only to generate admiration. Projective denotes the making available of a collection for the purposes of study and discussion on the basis of engagement with the present. He elaborates this distinction as one between temple and forum, ‘architectural beauty’ and architectural discipline, Riegl and Semper. This framework must help him to explain the deadlock in the period between the wars. After the appeal by Willem Leliman in 1912, efforts to found an architecture museum ran aground. In those days, A et A considered itself the owner of the debate to such a degree that it sought a ‘dead’ museum. For that was preferable to a full-fledged institute that would possibly compete with the society. Once again, Figueiredo sees the solution in a synthesis. Surprisingly enough, it essentially comes down to the fact that the ideal projective institute is the dialectic synthesis of the reflective and projective positions. (Anyone remember Charles Jencks’s formula: ‘postmodern = ½ modern + ½ postmodern’?) What’s also confusing is that both terms seem to be borrowed from other architecture discussions with which the writer is familiar. So, dear reader, don’t immediately think of Donald A. Schön’s reflective practitioner (1983), nor of Somol and Whiting’s polemic case for a projective instead of a critical architecture practice (2002). To be sure, Figueiredo does mention these, and to my astonishment he even puts me forward as a precursor. Equally surprisingly, he ascribes the reorientation of research in the area of architecture history in the 1970s to the influence of Manfredo Tafuri. Yet this author was known exclusively through a Xerox circuit within the faculty of architecture in Delft and through a terrible English translation of his Progetto e Utopia from 1976. I would be more inclined to credit Ed Taverne. Tafuri’s influence would only be felt in public events organized by the Rotterdam Art Foundation, in which Umberto Barbieri was active. After the NAi. Het Nieuwe Instituut as Temporary Fashion Museum, 2015, page 336 and 337, The NAi Effect, Sergio Figueiredo, nai010 Publishers. The NAi, a deus ex machina? Despite the conceptual mapping of a difficult process extending back 160 years, the appearance of the fully formed NAi still seemed like a deus ex machina. How come it now proved possible? Owing to Figueiredo’s archive-based approach, a number of aspects are insufficiently illuminated. The professional associations, for example, were marginalized once the SAM had found a home for its archives. The inhibitory effect of the Department of Cultural Heritage was nullified by separating the NDB from it. Interest in architecture had not only grown but also become politicized through urban renewal, and was embraced by socialist aldermen with a penchant for culture and construction. After 1980 the by then well-established urban renewal process was generating commissions for a new generation of architects who were open to the international debate. Following the example of ARCAM in Amsterdam, many local architecture centres were set up. The more there was to discuss, the more the cultural capital of architecture grew. And its emancipation within art policy was confirmed in 1991 with the release of a separate government policy paper. Where, in the end, did it go wrong for the NAi? Should we blame Guus Beumer? Or Halbe Zijlstra? Or neoliberalism in general? If you pinpoint the moment neoliberalism arrived in the Netherlands as 1982, when the first Lubbers-led government started with cutbacks and privatization, you should also realize that many offshoots of the welfare state offered resistance in policy thinking. The political urgency of urban renewal slowed down the privatization of the housing market and the dismantling of the planning system. In the arts and cultural sector too, the key concept of ‘quality’ marked the transition from ‘specific wellbeing’ to ‘marketing’. For government members and public officials, the emerging NAi could still be viewed as a shining monument of ‘new policy’. Yet once it came into existence and the official ‘founding pioneers’ gradually left the stage, it fell victim to more stringent performance requirements, target visitor numbers, reduced budgets and the search for sponsors. Within a year after the opening of the NAi, a start had been made with clearing away the remains of the ‘anticyclical’ government support. The final section of The NAi Effect shows how the interaction between archive, reading room, exhibitions and debates gradually receded into the background, along with attention for a disciplinary culture. Figueiredo describes the suffering of the successive directors that the NAi had to endure after Duivesteijn’s departure. All of them loved architecture, even though they differed considerably in their choices: blockbusters by Feireiss, the marketing of SuperDutch architects by Betsky, and the offshore idealism of Bouman. They increasingly acted as mayors in wartime, able to survive the demands of the funding government body only by internalizing them. And thus the institute devoted to architecture gradually became an accessory in reducing architecture to a ‘creative industry’. Het Nieuwe Instituut – as even the name implies – was set up to finish the job. Only the legal requirement to care for the cultural heritage ‘with due diligence’ makes the archive the only subsidy support on which the entire undertaking now rests. For the time being, lovers of architecture have nothing else to expect anymore. Architecture critic Hans van Dijk is a university lecturer at the Faculty of Architecture at TU Delft. In 2009 he received the Prize for Art Criticism, an oeuvre prize from the then Fund BKBV. The exhibition ‘Rijk aan Ontwerpkracht – 25 years of Dutch architecture policy’, made by the office of the Government Architect and previously on display at TU Delft and Het Nieuwe Instituut, is on show until 26 March at the Architecture Centre Amsterdam, Prins Hendrikkade 600, Amsterdam.